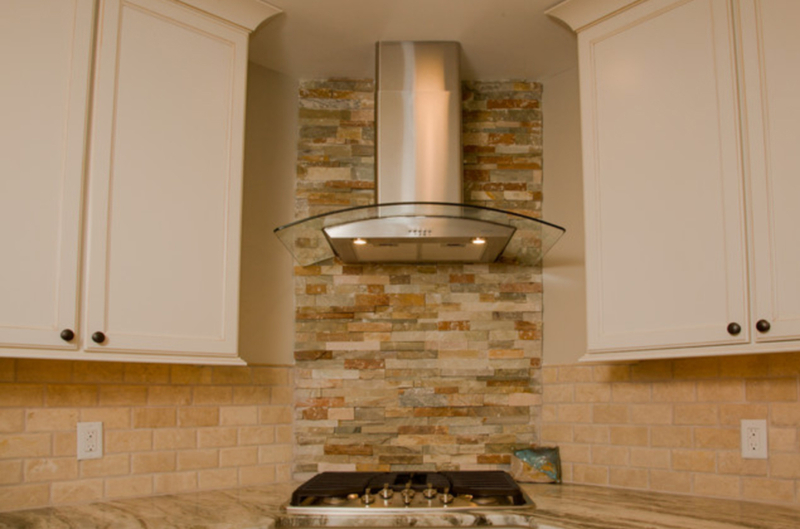 Putting the “splashy” in kitchen backsplashes - Chester County Kitchen and Bath - Your Dream Kitchen is Just a Call Away! 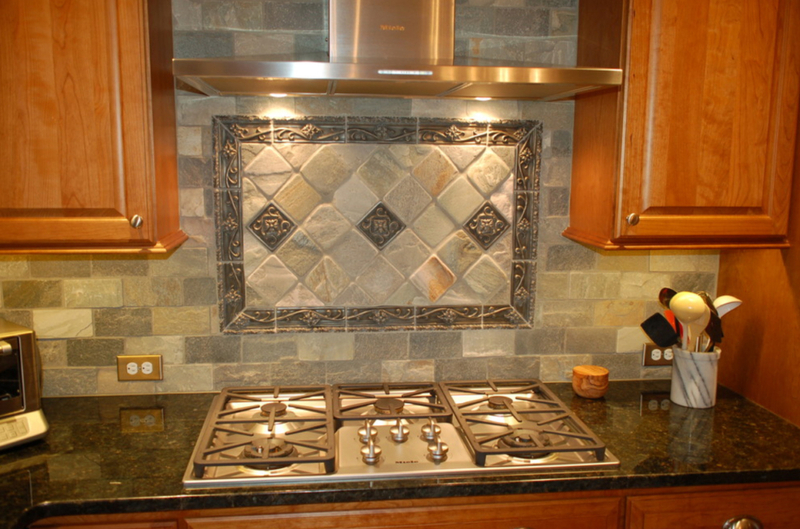 Decide to put style front and center with a backsplash that defines your tastes and draws attention. Many kitchen renovations start with the same goal in mind: “We want to make it more ‘us’.” But sometime during the process, doubts can creep in. The term “resale value” rears its ugly head. And the very changes that excited you and captured your personal tastes take a backseat to what you imagine others would or would not approve of. This is YOUR kitchen, after all. Not your aunt’s. Not your father’s. Not the neighbors’. If variety is the spice of life, then we suggest that individuality is the secret to loving your dream-kitchen-to-be. As individuals, we are all drawn to different styles, colors, materials and vibes. Some of what we find most appealing comes from what we knew growing up (and liked or most definitely didn’t like). Some tastes develop over time – as exposure to different looks increases after traveling abroad or even just to another region here in the U.S., while others have been there all along. Sometimes, reading renovation blogs like this one, watching home shows and paging through magazines and vendor catalogs is what helps an affinity for certain features to develop. Regardless of the how or why what you like in a kitchen came about, the fact is, it iswhat you like. If you feel it in your gut, have pictured it in your mind and have dog-eared page after page showing head-turning tile, Chester County Kitchen and Bath says, “go for it!” On the other hand, if you despise kitchens with attention-getting elements, this is not the blog post for you (there, we just saved you six valuable minutes…but please come check us out again next week!). Backsplash tile is a simple but sensational way to add uniquenessand excitement to your kitchen. Whether you choose a single area of the space to have some fun with — such as behind the range, around a wet bar or near a large window or eating nook — or are looking to let your adventurous spirit loose throughout the entire space, the possibilities for personalizing your kitchen are endless. As the dream-kitchen decider, you are the boss! Consider color, style and/or pattern. Entertain the idea of texture as well as metallic or glass accents. Look at samples. Mix things you wouldn’t normally picture going together. And ask our kitchen and bath design experts for suggestions. 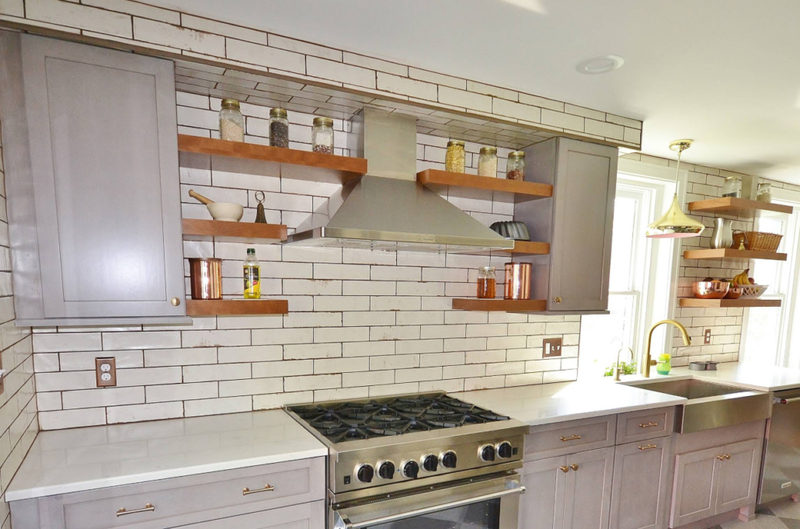 If cookie-cutter kitchen design, neutral walls and white subway tiles have you longing for a space more inspired, then it’s time to take a look at just what can be done when you open your mind to the array of options available to you. When it comes to color, think crayon box. Too often, clients come to us with a bias for beige. Don’t get us wrong – beige is tasteful. It blends. But is that what you want from color? Think about shades of green, gray – even oranges and reds. There are some beautiful blues out there, just waiting to show off their depth and diversity. Even black — though some would consider it devoid of color — lends something different and dramatic to the kitchen. A client will sometimes tell us, “We love this, but we’re afraid the people we end up selling our home to won’t…”. The fact is, there are as many varying tastes in the world as there are people. Do you really want to plan YOUR kitchen — a space you will live in day in and day out — around a stranger who is yet to be identified? You might own your home for the five more years that you expect, or you could end up living there for a decade. Our advice? Do what feels right to you. Incorporate colors that make you feel comfortable — or stimulated. Energized — or relaxed. Match that vase you found in Barcelona, the wine glasses you picked up in Murano or even the painting you brought back from Paris. Color can mean all the difference between a backsplash that checks all the boxes and one that shows the world you color outside the lines. Hexagon. Moroccan. Tin. Oh my! 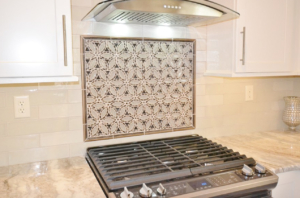 From a tried and true traditional like mosaic to stainless steel backsplashes and those with sheen, the only limits to what you can incorporate into a backsplash is your imagination (and possible insecurity about creating something too fabulously “wow”). Are you looking for more luminence? Consider mirror tile. A country-meets-city feel? Try floral motifs. Interested in something fresh and clean? You may love incorporating nautical elements. Style is in the eye of the beholder, so rather than worrying about who might find fault in your metallic finish or desire for dark grout, relish in the opportunity you have to break away from the Joneses. To surprise the Smiths. And to instill copycat tendencies in the Taylors. Chester County Kitchen and Bath’s Kitchen & Bath Showroom provides over 3,000 square feet of cabinets, tile, flooring, appliances, and more for kitchens, baths, and those in-between areas you’re ready to update. When you want to branch out from surfing the web and paging through magazines for inspiration, take a trip out west (West Chester, that is…) to explore the styles that could fit your life as well as your likes. From circular and herringbone to ombre (can you say, “gorgeous”?) and the ever-bold basketweave, patterns are another way to liven up a backsplash without having to go crazy with color. The point is to enhance — not detract from — your kitchen’s décor. The options for tile patterns sound like something much more complex than they really are. Consider Stacked Vertical, 1/3 Offset, Chevron and Grid. There’s the pinwheel look, and the ever-popular angled herringbone. Which one suits your space best? That depends on everything from your countertop materials and cabinetry choices to the amount of space and light you are working with. 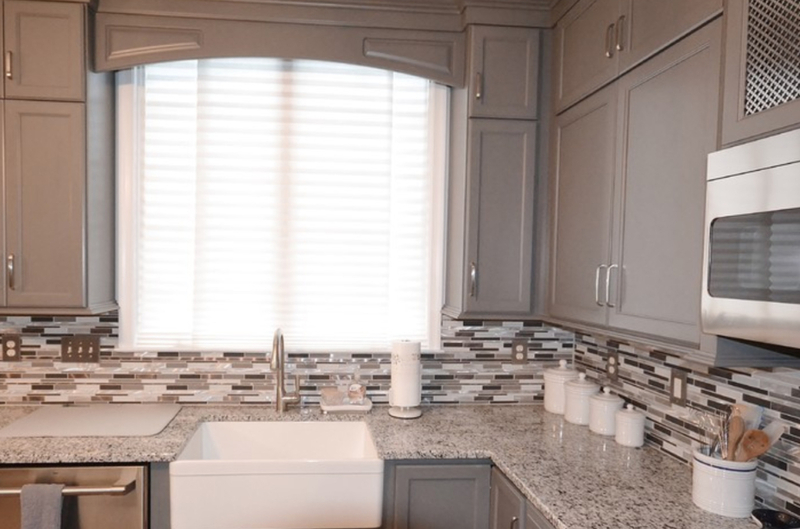 The design-decision making process can get rather overwhelming, but with more than 25 years of kitchen and bath renovations under our (tool)belts, Chester County Kitchen and Bath has the insight and experience to show you around the playful possibilities that patterns bring. Ready to bring the backsplash front of mind? Then contact our kitchen and bath design professionals today. 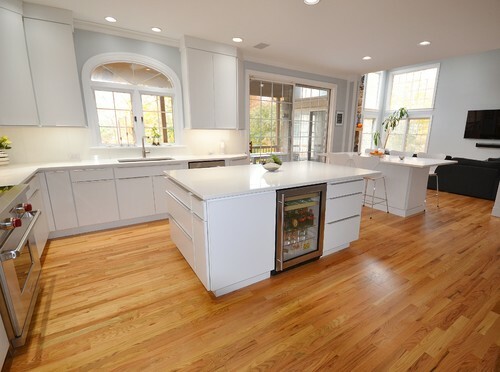 Whether you just want to saunter through our showroom — or delve into a full-fledged redesign, Chester County Kitchen and Bath is ready to serve…and impress. Traditional Kitchen with Storage Galore Metallic accents have it all glowin’ on.